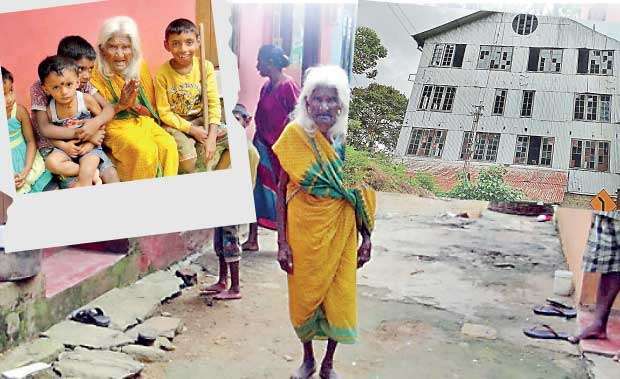 A 103-year-old woman by the name of Muththu Theivani, who once worked as a tea plucker in the Spring Valley Estate in Badulla, recalled her days spent among the Tea bushes mixing with other fellow women who were employed in the estate. Theivani said that she joined this estate at the age of 12 and earned 18 cents per day. She now spends her retirement in a line room (Quarters for estate workers) adjacent to the estate’s tea factory. “Those days this place looked so beautiful with fertilizer being used regularly and the tea bushes producing crop abundantly. Now the estate looks neglected. During our time we looked after it as our own eyes. Now tears roll down our cheeks when we see the present plight of the tea estate,” she said. The Europeans at the outset brought labour from India to work in these tea estates. When Theivani’s parents came to Sri Lanka for this purpose she was only four years old. She joined other workers at a young age. When she reached age 18 she received 49 cents per day, the amount paid to other workers. The workers used to grow Green Gram, Cow Pea and other pulses in their gardens at home. At that time they had enough to eat. Every household had a dairy farm with one or two milking cows. The milk was consumed by the workers and never sold. She remembered how the owner of the estate arrived on horseback and inspected the line rooms. If these places were found to be unclean or not maintained properly a fine of Rs 100 was imposed. The walls of the line rooms had to be applied with a lime preparation every six months. The drains were cleaned once a week using Jeys Fluid. There were no mosquitoes because the place was kept clean. There were no schools in the estates at that time. Theivani’s father never believed in educating the children as it was better for them to work in the estate and look after their cattle. The family had a herd comprising 20 heads of cattle, among which were 5 milking cows. She remembered how cheerful they were when they went in groups to pluck tea leaves in the early hours of the morning. The end of each day was exciting for the group because they wound up activities with a bath in the nearby water spring. Love was not in the air for her at that time. 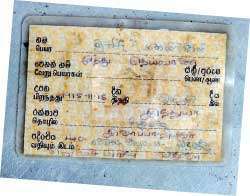 However she was given in marriage at the age of 16 to G. Muththu from Badulla. She had seven children from this marriage; five daughters and two sons. Her husband was a travelling merchant selling gold jewellery. The estate women were enchanted by these gold ornaments that were on sale. She remembered wearing heavy gold earings weighing about 7 sovereigns each, but now those ears are bare. The earlobes have been stretched due to the weight of the gold ear studs she once wore. Her eldest son had died of a heart ailment at the age of 35. Her husband also died in a similar manner. She has a son who is in India and frequently speaks with her using Viber. Theivani has never been a burden to anyone in the estate or to her family. Now she tends to the needs of her grandchildren until their parents return home from working in the estate. She has her own poultry yard which provides her with seven or eight eggs a day which helps her to keep the home fires burning. Since of late she has been of service to the estate families by being a person who performs religious rituals and invokes blessings during sicknesses. She performs these services for free, but feels happy and contended with what they gift her with. 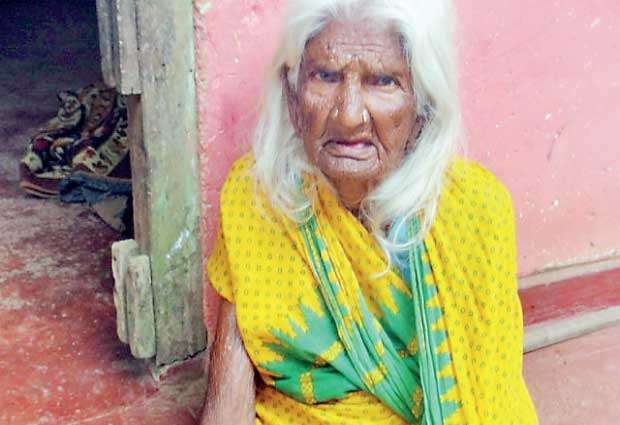 Though age and frailty have taken over she never forgets to go on her annual pilgrimage to Kataragama. Earlier the estate people used to go on pilgrimage to Kataragama in groups. They used to collect the food and other requirements needed for the journey. She remembered how they used to travel through forests teemed with elephants. Their good intentions and the faith they have in God helped them to accomplish their mission without being harmed by wild elephants. She said she believed that the elephants are the ghosts of God Ganapathy and when they are on the way to honour God Ganapathy these ghosts would never harm them. She does Kawadi dancing at Kataragama where she gets into a trance. She said that she greatly enjoys it. She said that she believes that the elephant symbol signifies the Lord Ganapathy and reiterated that it would have been better if the Europeans were still in Sri Lanka managing these tea estates.